"Running (Refugee Song)" Brings Together Hip-Hop's Common And Jazzman Gregory Porter For A Cause : Goats and Soda Keyon Harrold, the trumpet star and one of the composers, talks about the art of creating a song with a conscience. At first it seems like a typical music video. A big, calm-looking bearded man sits in a posh armchair and sings in an emotion-choked baritone, "I'm running, I'm running, I'm running." He's Grammy Award-winning jazz singer Gregory Porter. A little bit into the song, a rapper joins in: "I fight through the night just to find a stronger day." He's the Oscar-winning hip-hop artist Common. But they're singing and rapping about the unlikeliest of topics for a song: refugees. 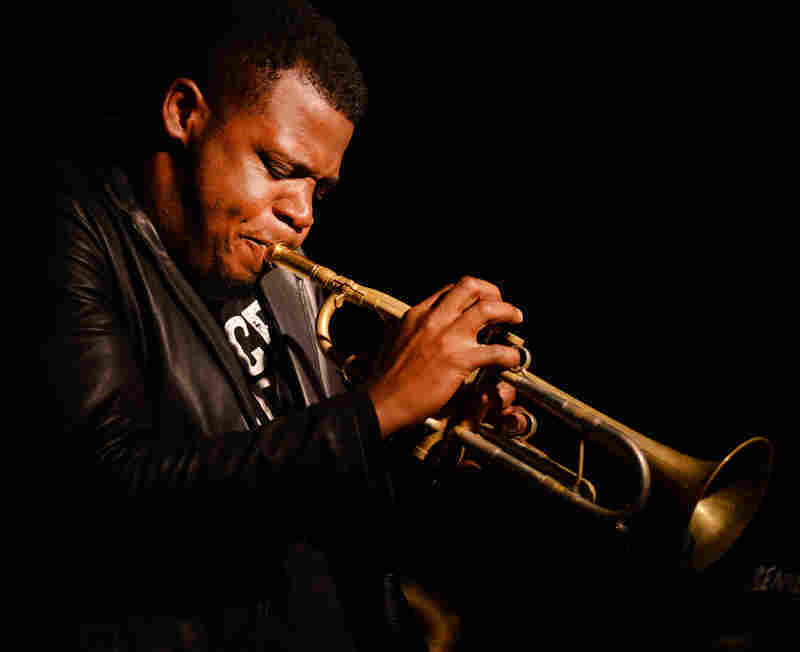 Keyon Harrold performs at this year's Melbourne International Jazz Festival. He's the co-founder of "Compositions For A Cause." "Running (Refugee Song)" was released this week in honor of World Refugee Day. It's the first composition from a new venture called Compositions for a Cause, a collaboration of musicians Keyon Harrold and Andrea Pizziconi. Harrold, an acclaimed trumpeter, composed the song with Pizziconi. Common contributed to the lyrics. The song can be downloaded from refugeesong.com for a donation and will soon be available on iTunes for $1.99. Proceeds go to some of the world's biggest refugee-oriented groups, including Refugees International, Human Rights First and the International Rescue Committee. To learn more, we spoke with Harrold while he was riding on a bus; he's currently performing with the soul singer Maxwell on a national tour. The interview has been edited for clarity and length. Did a refugee group ask you to write a song about refugees? Actually it's the opposite. Myself and Andrea Pizziconi were talking. We wanted to do something together musically and the prerequisite was that it had to be cause-related. 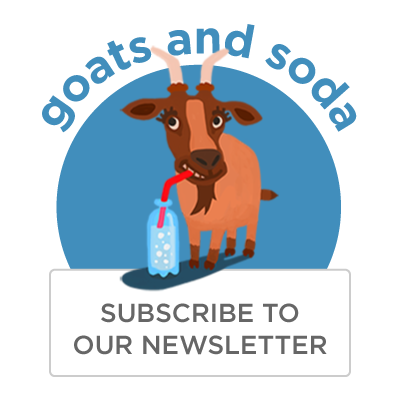 We wanted to help people, raise funds, raise awareness. So we started this thing called "Compositions for a Cause," and this song happens to be the first one we wanted to attack. Andrea was the one who really opened my eyes to what was going on as far as that crisis. We scrutinized every word and statistics about what was going on. And I started writing. It might be hard to get people to pay attention to the refugee crisis. It doesn't seem like an issue that's top of mind in the U.S. Absolutely. We're thinking about Donald Trump and gun violence, but meanwhile there's like 35,000 people every day being displaced who can't go home. They're literally running from the place that they know. Is it different writing a song about a cause than writing a regular song? What's different is you have to be very careful in what you say because it will be scrutinized. I did a focus group to play the song for refugees. I wanted to see that it was actually valid. Where were the refugees from? I did it at one of the International Rescue Committee classes [for refugees] — they were from Sudan, they were from Burundi, places in Asia, from all over the world. Did your research change the song? The song used to say, "God, show me where to go, I'm running, I'm so tired, I'm so worn, I just hope someone can hear my song." But we had to rethink certain things about it. We changed it to a hopeful place: "I want to go someplace where I'm safe and strong." Since the refugees who listened had made it to America, the song is now more of a triumph. You got A-list talent to perform the song. Common and I go way back. He was my first employer on my first tour in 2000. I work with Gregory a lot. I worked with him on his new record, Take Me to the Alley. And this song is hot off the musical presses. Common recorded last Wednesday. Greg recorded Thursday. I was doing rehearsals with Maxwell in Seattle, and I took a train for three hours to Portland and we recorded Gregory in the hotel room. The song has a jazz feel to it. And jazz isn't the most popular musical idiom. Why did you decide to go with a jazz song? Do you think it's jazz? You know what, I'm a musician, a producer, a composer. Once I write the music, the artist gets to typically decide what the genre is going to be. If Justin Bieber sings the song, I don't care if the beat is swung ... it's pop. How will you know if the song is a success? I pray that lots of people download this song and actually learn about what's going on and take some time to delve into the situation. People need to know this exists on a daily basis, people leaving and being shoved from their homes in so many ways. I'm praying people download it so we can raise a lot of money to go to the front lines of the refugee crisis. Is there one fact about refugees that really struck you in your research? What's staggering to me is the number of people who are displaced. Right now, 60-some million people have nowhere to go. That's crazy. Can I ask a question about your other musical work? You played the Miles Davis trumpet parts in the movie Miles Ahead, starring Don Cheadle. Was that intimidating? It could have been pretty intimidating if I would have thought about it. But Miles is one of my biggest influences. I didn't have to study to sound like Miles, I know what that is. It's the equivalent of me talking like my dad. I know what my dad sounds like. And that's your trumpet on "Running" I assume. Andrea was like, "You gotta play the trumpet, come on, put some horn in it." What's next on the agenda for "Compositions with a Cause"? We're deliberating on what's gonna be next. There's so many causes. Some causes will revive an old song — like the re-recording of "What The World Needs Now Is Love" to raise money for the LGBT Center of Central Florida in the wake of the Orlando massacre. What do you think of that? There's definitely a value in that. The beauty of songwriting is that if it's a good song, no matter what beat it is, it's going to stand the test of time. I aspire to write songs like "We Are The World" that touch people, that have political and social impact. A song that people need to get through as an anthem in life.